Tomoe Gozen was a late twelfth-century female samurai warrior (onna-bugeisha), known for her bravery and strength. She married Minamoto no Yoshinaka and served him in the Genpei War and was a part of the conflict that led to the first shogunate in Japan. Her family had strong affliations with Yoshinaka. Her father, Nakahara Kaneto was a strong supporter of Yoshinaka and also his foster father, who raised him since he was two. Her mother was Yoshinaka’s wet nurse. Two of her elder brothers also served Yoshinaka as generals. 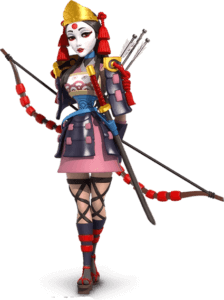 She is best known for her loyalty and courage at the Battle of Awazu in 1184.